It’s time for the Pumpkin Massacre! 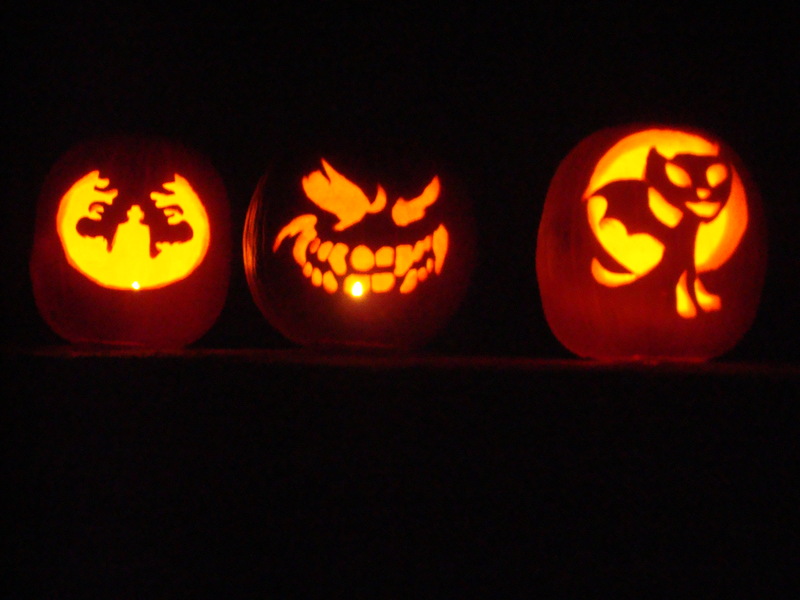 The Jack-O-Lantern is the quintessential Halloween decoration. It’s a must-do every year at our house, and that usually means, “Mom MUST-DO the yucky part”. You all know what that means… Mom has to take the guts out. And, Mom LOVES to do that part. Ripping out all the squishy, sticky, ooey-gooey insides of the pumpkin is wonderfully gross. Especially when I squeeze it through my fingers. The kids can’t stand that part. I call them chickens. This year I decided to buy one of those cheap pumpkin carving booklet/tool-kits they sell for three bucks at the store. Before I could tell the kids I didn’t want them to pick the hardest patterns in the book, that’s exactly what the youngest two did. *sigh* I really should have seen that one coming. At least the kids were helpful as we taped the patterns to the pumpkin. Each of them patiently waited for me to finish helping with one of the other kids, before moving on to help them. Since the tool that scores the pattern onto the pumpkin was missing from the package (I didn’t notice that in the store, but that’s my kind of luck), the kids were going to use a punch tool that came with the kit. I suggested toothpicks would also work, and Josh and Callie worked quietly, diligently marking out their pattern. The kids really surprised me, because I did not hear the usual complaints. “When is it MY turn?” “She/he is taking too long!” “This is boring!” “Mine’s not working!” “When can I be done?” They were calm, they waited their turn, they helped each other, they even said words like “please” and “thank you”. Mister had his HAM radio set up outside and was listening & talking while we were all out there. The kids were actually quiet enough for us not to be bother to him while he was focused on that. Plus, the kids and I were greatly entertained by some of the conversations that were going on over the airwaves (like the guy who was openly talking about the diarrhea he got from a Walmart chicken… The kids and I about died laughing). Anyway, I’d like to thank the person who stole my kids and replaced them with these well-behaved, kinder, politer children. Actually, that only lasted for the pumpkin-carving, but I’ll take what I can get. As far as carving kits go, why have I not done this before?!! I thought having a sturdy metal spoon was fine for scraping out the pumpkin innards. I was so wrong!! That cheapo piece of plastic scraper was a MACHINE at getting that stringy stuff out. And those flimsy little saw-like tools? WAY better than the normal humongous steak-knife we use. When the kids started out working away with their little saw-knives, I figured they were still going to do the usual hatchet-job on the pumpkins (just using smaller, more annoying tools). Ohhhh nooooo… Those things were fantastic! I started wishing I had got my own pumpkin to carve. Until I had to help the youngest two with their patterns, and then I quickly got that out of my system. We all had a great morning, and the kids really did a fantastic job on their Jack-O-Lantern’s. They turned out so much better than I thought. Next year I’m buying more of those nifty little tools. Those things are BOMB! Josh took some pictures of all of us while we were working, so I just put them all in the slide-show below. Wow! Awesome job guys! That ALMOST makes me want to go buy a pumpkin to carve………….nope, the urge quickly left me! 🙂 That does look like a lot of fun though, waaaay better than any pumpkin I ever carved. I remember one year when the girls were little I gave up carving and painted the “rug-rats” cartoon characters on the pumpkins instead. They actually came out pretty good, but the best part was after Halloween when we took the pumpkins up into the mountains and used them for target practice! It seemed like a good idea at the time, but looking back now, I’m not so sure that was the best thing to do with the girls. They did seem to enjoy it though. Well, its not like I was ever going to win Father of the year anyway! LOL Plus, it’ll give them something to talk about in future counseling sessions when they are older and try to sort out what all I did to their poor lil melons when they were kids! Is there something actually wrong with that?! I would have found that to be loads of fun!! I’m fairly good at target practice, I would have enjoyed that immensely! Good idea when we’re done! Target practice is a LOT more fun than just throwing them in the trash….